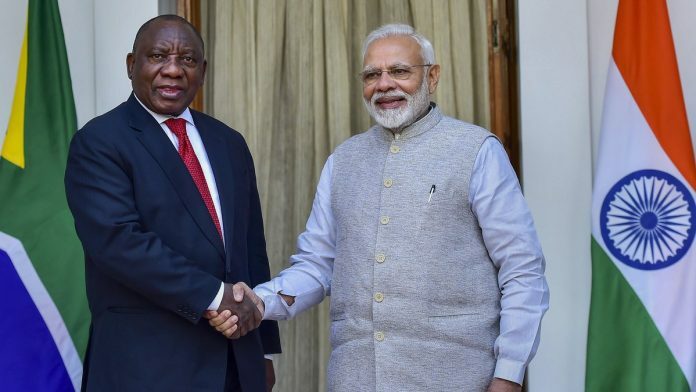 After his meeting with Prime Minister Narendra Modi, South African President Cyril Ramaphosa emphasised on deepening the bilateral economic relationship. New Delhi: India and South Africa Friday signed a three-year strategic action plan with time-bound goals to take their bilateral ties to the next level. Both sides aim to enhance their security partnership in the Indian Ocean region. “We concluded this morning a three-year strategic programme of cooperation aimed at deepening the bilateral engagement between India and South Africa and ensuring a result-oriented partnership benefits the people of both countries,” South African President Matamela Cyril Ramaphosa told the media after his first-ever bilateral meeting with Prime Minister Narendra Modi at Hyderabad House in New Delhi. The strategic action plan is aimed at strengthening ties between both the countries across all sectors. President Ramaphosa, who will be the chief guest at India’s 70th Republic Day celebrations Saturday, also said there is “considerable scope” for the two countries to grow and deepen the bilateral relationship, especially at the economic level. He said he wants to extend the growing bilateral trade to a higher level. India is South Africa’s second-largest trading partner. The South African President also urged an enhancement of cooperation from sectors ranging from agro-processing to defence. Later in the day, while addressing Indian and South African industry leaders, the President said both sides can look into greater cooperation in the field of education and skills development. He also highlighted that the two-way trade between both countries needs to be expanded. Bilateral trade between India and South Africa has stagnated at around $10 billion in the last four years. Two-way trade in goods stood at $10.65 billion in 2017-18, according to data from the Ministry of Commerce and Industry. Prime Minister Modi, while addressing industry leaders, said Indian investments in South Africa have been growing continuously while generating around 20,000 jobs locally. Indian conglomerates like Tata and Mahindra have high-quality investments there. PM Modi also batted for easier visa norms for business people between both countries, and urged South African firms to invest in India’s fintech, aerospace and defence and Information and Communications Technology sectors, among others. Modi stressed on the growing role being played by both countries in terms of an enhanced security partnership in the Indian Ocean region under the Indian Ocean Rim Association (IORA). In the field of defence, both countries are looking at greater defence purchases and joint ventures under the ‘Make in India’ initiative. India and South Africa are partners in multilateral forums like BRICS (Brazil, Russia, India, China and South Africa), IBSA (India, Brazil and South Africa), IORA and the G20. President Ramaphosa recalled India’s cooperation in electing South Africa as a non-permanent member of the UN Security Council. This is President Ramaphosa’s maiden visit to India. He is the second South African President to be the chief guest at the Republic Day parade, after President Nelson Mandela in 1995. Both leaders also commemorated their respective national figures—Mahatma Gandhi and Nelson Mandela—for their immense contribution towards the liberation of their own countries. “Gandhi and Madiba (Mandela) were products of their time… In many ways they were men who were far ahead of their time. It is indisputable that they were great visionaries, it is equally indisputable that they were great thinkers as well,” Ramaphosa said. The lecture he was delivering, the first IBSA Gandhi-Mandela Memorial Freedom Lecture, was organised by the Indian Council of World Affairs. This report has been updated with quotes from events that took place Friday evening.